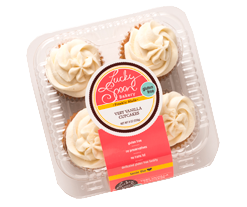 The cupcake craze has met its gluten-free match. 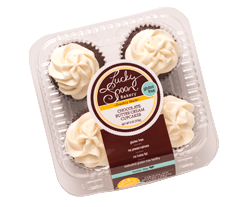 An experience that begins as the butter cream frosting melts in your mouth and finishes with a satisfying vanilla cake. A beautiful pairing for any special event including a private party of one. Ingredients:Flour Blend(White Rice Flour,Potato Starch, Potato Flour), Eggs, Brown Sugar,Butter,Invert Sugar, Milk,Water,Vanilla Extract,Leavening(Sodium Bicarbonate,Sodium Acid Pyrophosphate,Monocalcium Phospate),Soy Lecithin,Xanthan Gum, Salt,Almond Extract. Baked in a facility that processes nuts. Ingredients: Flour Blend(White Rice Flour,Potato Starch, Potato Flour), Eggs, Brown Sugar,Butter,Invert Sugar, Milk,Cocoa Powder,Water,Vanilla Extract,Leavening(Sodium Bicarbonate,Sodium Acid Pyrophosphate,Monocalcium Phospate),Soy Lecithin,Xanthan Gum, Salt,Almond Extract. Copyright © 2015 Lucky Spoon Bakery. All Rights Reserved.